As I said before I am a second-hand book dealer by day, so I spend a lot of the weekend at car boot sales (that's fleamarkets for those of you across the pond) buying stock. 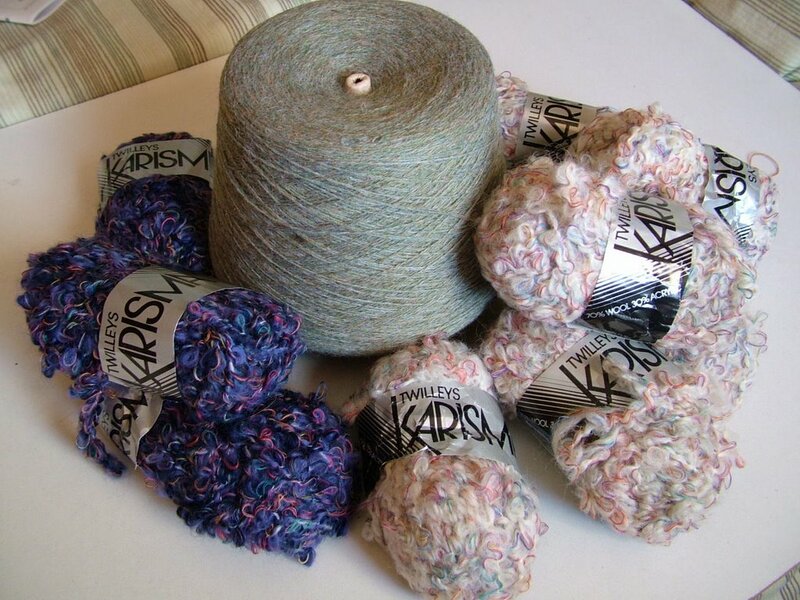 This also gives me the opportunity of sometimes adding to my stash with the odd bit of wool. This is Sunday's haul - that's 1300g of lovely grey/greeen tweedy pure wool that's just crying out to be socks, and some Twilleys Karisma which is a loopy sort of yarn 70% wool and 30% acrylic - not sure what to do with it yet. There are thirteen balls of the creamy colour and three of the purpley one. Plus - I'm not sure quite what possessed me but they also had a whole fleece - she said it was Jacobs - and it was only £2, so I bought that too - I've already packaged it up and stored it away (to keep dog hairs off it) so I can't show you. Now I can't spin, and I don't have time for yet another hobby, but I couldn't resist it. So now, added to the stash I have this fleece. I guess at some point in the future I will have a go at spinning - but don't hold your breath!! 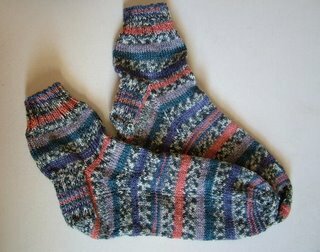 In other news - I've finished the Opal socks (my first completed pair for Socktoberfest). I've also finished the soul-draining red garter stitch scarf for the Evilpixie, apart from adding the fringe. Next project is a pair of socks for Pete as he has been sadly neglected on the knitting front so far. I have finished The Book of Lost Things by John Connolly. I really liked it, despite it's not being the kind of thing I normally like. It's a fantasy tale about a little boys journey towards adulthood and also towards acceptance of his mother's death. It certainly keeps you reading right to the conclusion, and I found it unexpectedly moving at the end. It is also very funny in places - John Connolly can really do funny - who knew? I particularly liked his take on Snow White and the Seven Dwarfs. Anyway I am now reading Locked Rooms by Laurie R King. So far it is really good, now that I'm coming to terms with Sherlock Holmes in San Francisco. This is for reading group this month so I'm glad I'm enjoying it as I sometimes find myself struggling with the selected books (like last month's Peter Tremayne). Anyway it's going well so far - more on this later no doubt as I get to the meat of the plot. Mere Green Library's having a book sale of discarded stock next week ... :-). Just wanted to pop in and say hi, and welcome (I took the link from Ms. Knitingale). Your socks, Juno look fabulous...and I'm most definitely smitten with Bubba. seriously. Great snag on that grey/green tweedy wool, wow, what a find. I'm with you on the spinning thing, but...someday I will spin. found your blog cos I'm a fan of miss knitingale! I recently took up spinning since I was given loads of fleece free on freecycle (its a yahoo group). Is the fleece washed? anyway, watch the spinning.....its addictive but extremely relaxing!